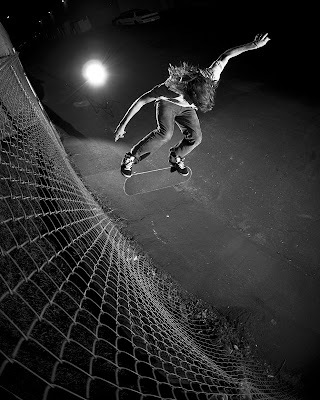 Micah Wood is a skateboarder from Salt Lake City. He skates for BC. 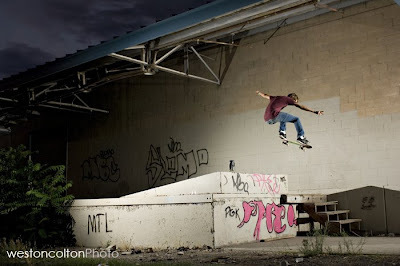 I met him 2 years ago and was blown away by his skill on a skateboard. I think I have come away with a great photo every time I have skated with him. The first time I met him he switch kickflipped over the white rail and backside heelflipped the white rail...in the rain. This is portfolio of Micah--some old and some as recent as last Saturday. Enjoy. I know some crazy tricks have been done down this, but just look at that style. And the cops showed up before any real tricks could go down. These are great! Unique lighting and angles. The last one with the rain/flash is sweet. These shots are awesome. Saw your blog on a link, glad to have stumbled upon it.